In last year's Oscar-winning documentary Citizenfour, NSA whistle-blower Edward Snowden expounded on the terrifying extent of government monitoring being used to supposedly keep us safe in the war on terror. Now, the aggressive tactics being employed by the FBI to incriminate a target in (T)ERROR help illuminate other ways in which rules are bent, and perhaps even broken, in the name of homeland security. 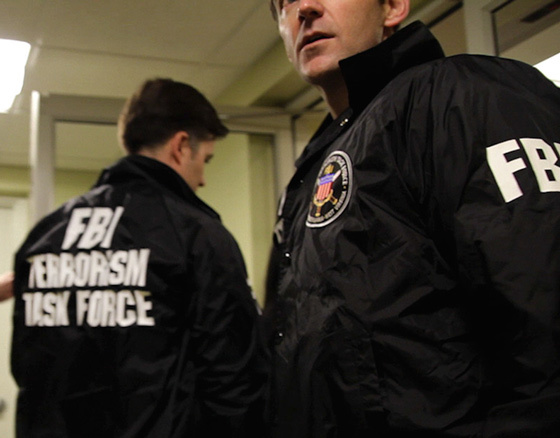 We meet Saeed Torres, an FBI informant who has regularly been financially compensated for befriending Muslims suspected of terrorist activities and engaging in tactics that border on entrapment to bring them into custody. His biggest coup to date was getting close to Brooklyn jazz bassist Tarik Shah and enticing him to simply talk about the possibility of training members in Al Qaeda. It was enough to put Shah in prison, where he's now been since 2005. In what Torres hopes is one last big payday, his newest target is a white Muslim man in Pittsburgh named Khalifah Al-Akili, who has made some posts on social media that have drawn red flags for their support of Osama Bin Laden. The filmmakers are provided astonishing access without permission from the FBI, as Torres details initially meeting with Al-Akili and his subsequent attempts to earn his trust. For what sounds like an awfully tantalizing premise, the documentary's intrigue never really amounts to much more than transcripts of text messages exchanged between the two and recaps of their meetings. The latter isn't helped by the fact that Torres is rather disagreeable much of the time and seems mostly burdened by having to explain everything to the cameras in addition to what he is being paid by the FBI to do. But things take a welcome and unexpected turn when Al-Akili begins to suspect that Torres is an FBI informant and then goes public with those suspicions. This leads the filmmakers to shift their perspective to interview Al-Akili and hear his side of the story. His ultimate fate reveals some troubling truths about the ways that information is obtained regarding suspects and how much weight is given to evidence that might not be as damning as it appears.